* How to reduce weeds AND grow your plants. This page works on how to recognise annual weeds, and how to use effective tools, methods and materials that will remove them with least disturbance. Annual weeds can grow all year but especially in the Spring and Fall time. The actual trigger usually comes from a few wet spring days. Although you may have hoped for rain to make your seeds and plants grow the same conditions bring on the weeds too. And the many rapidly overtake your few cultivated seedlings. Therefore one useful method of weed control is to germinate your plants in modules and seed trays and plant out. Then the secret to controlling the weeds comes with a natural organic material that is also an organic fertilizer. This natural by-product prevents weed seedlings developing lateral roots. You can't use it where you sow seed, but if you plant out as suggested above then apply this material as described on the next link, your seasonal flush of annual weeds should then be controlled. For more information on this natural weed inhibitor click this link. To find the product now click here. Flame weeders provide a good way to deal with annual weeds. They can be used on paths and drives too. You'll find information on types of flame weeders and how to use them on this link. Traditional hand weeding is not so bad. Some gardeners advise doing this when the soil has dried. A sharp hoe is used to slice the weeds at the surface. The annuals quickly whither and die in the sun and while it remains dry you won't get regrowth. But in soft soil shortly after rain you can easily lift your weeds out whole, roots and all. A small fork see link below may help to loosen the earth. And with a firm grip you'll be able to pull the lot out. As long as the earth is not too wet to stand on this isn't a bad time for hand weeding small areas. You'll find the best small tools for hand weeding on this page - and there are some comfortable kneelers to keep your knees warm and dry. You'll find links to my pages on long handled tools & how to work with them here. Persistance pays off. Take my Dad's advice and whenever you go down the garden and pass an errant weed, root it out then and there. But let me add, that if your garden has lots of weeds don't worry about them. Better to leave the weeds growing and the soil settled until you are ready to tackle them. Tackle large weedy patches in small manageable pieces and you'll get done. Only cut the lot down with shears before they set seed if you can. Is It A Weed Or A Plant? Can you spot the carrot seedlings among the annual weeds in this picture - right>>? When you don't know what your seedlings will look like it helps to sow them in a straight line. Then look out for a line of similar looking seedlings. 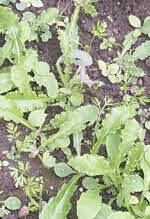 Of course it's better if you can recognise your seedlings and are able to identify seedling weeds. 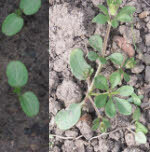 You'll know which are the tiny annual weeds and which will be large perennial weeds. 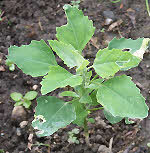 Most seedlings have seed leaves that look different to the adult foliage. But after a little study it is not difficult to recognise a plant from the shape of its seed leaf alone. Indeed it makes a fun puzzle to test a gardener's knowledge - seed below to try it. The picture right >> illustrates how seed leaves can look different to later leaves. This annual weed is Galium aparine also known locally as Goosegrass, Sticky Willey, Cleavers... The whole plant is covered with small hooks but the clinginess helps you drag it out and gather it together. One time I was directed to weed 3-5 foot holly shrubs but could not find them because they were totally smothered by Goosegrass. When you recognize the seedlings in autumn or spring you can get it out early. And you won't get caught by the hooked fruits and spread them. Take care to brush them off before moving on. What does the picture right show? 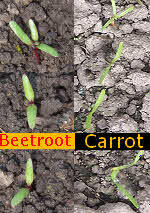 Click to compare Beetroot and Carrot seedlings with Fat Hen seedlings which have a slight mealy covering. But Fat Hen seedlings grow into weeds. Control by hoeing seedlings. Pull out larger plants before flowering. However, they may also be used as mineral rich herbs or green manures. Good King Henry Chenopodium Bonus Henricus is a close relative that is used like Spinach. Another way to deal with annual weeds when broadcasting seed is to allow the weed seeds to germinate before you sow your seed. Then use a flame weeder to kill the seedlings before sowing your seed. This method reduces the weed competition. Check the links above for more details. An annual weed commonly spread from pot grown plants in garden centres. Although not there to begin with, it now grows throughout my garden. It is commonly seen in greenhouses too. 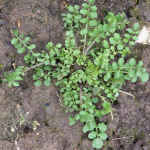 Bitter Cress has an early start and several generations. Even small plants produce flowers. Their capsules shoot out the seed when they suddenly break open. It's easy to weed out - I'm nearly rid of it here. This has ovate leaves on horizontally spreading stems with a line of hairs down the side. White flowers produced virtually all year around but viable seeds are probably not set in winter. Some organic gardeners harvest Chickweed for salads. But if not kept in the right place it will easily overgow your seedlings. It has a similar growth habit and similar shaped leaves to Chickweed but with tiny black spots underneath. Pretty scarlet flowers and spherical capsules are born on arching stalks. Has a similar growth habit to the above, leaf margins serrated. The pretty blue/white flower petals hold together as a small tube when they fall off like confetti. The leaves are larger and so make a denser ground cover.